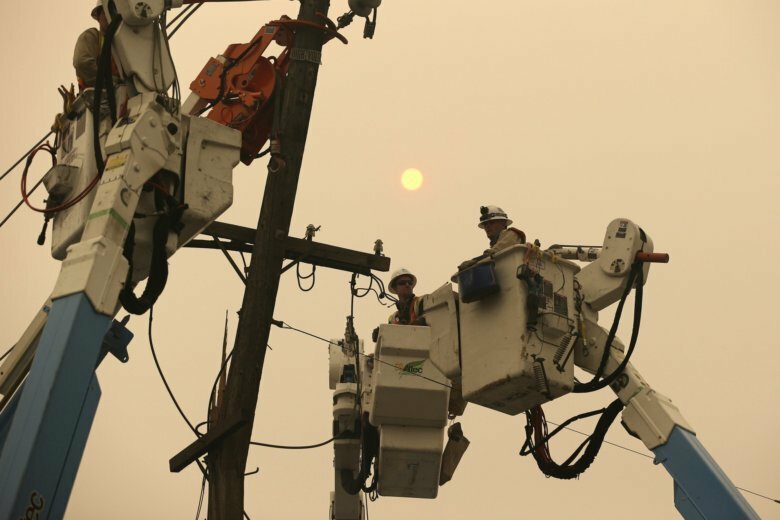 SAN FRANCISCO (AP) — A Northern California utility on Monday said it terminated one of its contractors helping with wildfire recovery after three workers posted on social media insensitive photos and comments poking fun at victims and the region. Pacific Gas & Electric said Bigge Crane and Rigging Co. will no longer help the utility repair widespread damage to its power lines caused by the state’s most destructive wildfire on Nov. 8. PG&E spokesman Paul Doherty said he does not know if the San Leandro, California-based company will continue to work with the utility elsewhere in the state. The posts were widely shared on social media and the photos showed the former workers sitting in front of destroyed homes, pretending to drive a burned out vehicle and jumping through the remnants of child’s trampoline. One photo showed a dead cat with a beer bottle in its mouth. Bigge’s corporate counsel, Randy Smith, said in statement Monday that the company fired the three workers after the Paradise city administrator complained about the posts. “We expressed – and express again – our deepest regrets to the residents of Paradise and Butte County who were egregiously insulted during an already devastating time at the hands of these three individuals,” Smith said in a post on the company’s Website. Smith didn’t return a phone call from The Associated Press on Monday. PG&E is facing a growing number of lawsuits alleging its equipment started the Camp Fire that killed at least 86 people, destroyed 14,000 homes and leveled Paradise, a city of 27,000 residents. PG&E reported an equipment malfunction at the time and location where the fire started, causing its stock to plummet 40 percent. The company’s share price fell $1.57, or 6 percent, on Monday after the California Public Utilities Commission announced the utility falsified records to hide the fact it didn’t have enough workers to locate and mark natural-gas pipelines between 2012 and 2017. Investigators have not determined the cause of the wildfire, but say the utility’s equipment caused 17 wildfires last year. PG&E is liable for any damage caused by its equipment even if it’s not at fault.